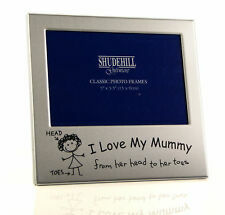 Shudehill Giftware I Love My Daddy Picture Photo Frame Sentiment Gift 5" X 3.5"
FREE POSTAGE ..... 59 TO CHOOSE FROM ! 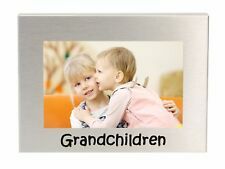 Grandchildren Photo Picture Frame Gift 6" x 4"
Above is where a 6" x 4" landscape photo can be displayed. 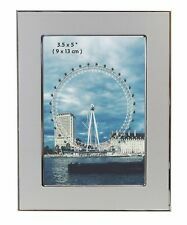 To the reverse is a stand so that you can display your photo on any flat surface. Add To Favorites. Will Take A 5" x 3.5" (13cm x 9cm) Photo. Add To Favorites. 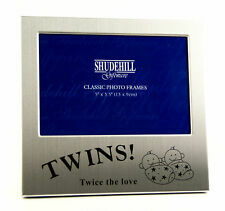 Lovely Chic Modern Black and Copper Photo Frame 4" x 6" Easy pull of back to place photo in. Self standing horizontal or vertical. Lovely chic modern finish. Comes in box ideal as a gift. Hold one photo 4"x6" Measures: H:21 W:16 D:1 cm. 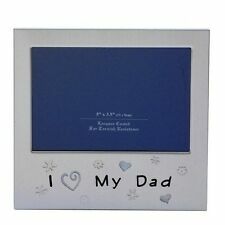 Me & My Grandpa Photo Picture Frame Gift 5" x 3.5"
The personalisation will feature below the photograph. If you are unsure about the personalisation, dont worry. Signs & Plaques. Newspaper Books. Mugs & Teapots. Money Boxes. Lunch Boxes & Drink Bottles. Both free standing & has a hook on the back for wall mounting. Photo size. Back just slides off for simple photo insertion. High quality finish. Designed in-house by us. Sixtrees Metro Black Aluminium photo frames with mounts 6" x 4" - 10" x 8"
Satin Silver Colour Brushed Aluminium Photo Picture Frame Mount 5 x 7", 10 x 8"
Lovely Chic Modern Rose Gold Multi Photo Frame 3" x 3" Stylish design frame with a rose gold finish Holds nine 3" x 3" photos, while the frame can be stood flat or angled back on the stand Metal with glass front Measures H:24 W:24 D:4 cm Lovely gift or to frame a special photo. 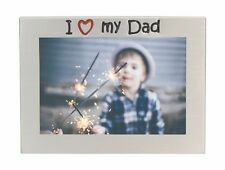 Lovely Chic Modern Grey Gold Multi Photo Frame 3" x 3" Stylish design frame with a rose gold finish Holds nine 3" x 3" photos, while the frame can be stood flat or angled back on the stand Metal with glass front Measures H:24 W:24 D:4 cm Lovely gift or to frame a special photo. Family Photo Picture Frame Gift Ideas for Christmas Birthday Mum Dad 6 " x 4"
Both free standing & has a hook on the back for wall mounting. Photo size. Back just slides off for simple photo insertion. Designed in-house by us. Simply personalised. Height: 21.9 CM. 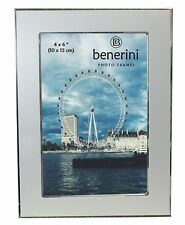 Lovely Chic Modern Charcoal Grey Photo Frame 5" x 7" Stylish design frame with charcoal grey outer edge and silver effect inset Holds a 5" x 7" photo in either portrait ot landscape orientation Metal with glass front Measures H:22 W:17 D:2 cm approx Lovely gift or to frame a special photo. "WHAT ARE LITTLE BOYS MADE OF?. Free standing - both portrait & landscape. Lacquer coated for tarnish resistance. Black velvet effect on the reverse. Will take a 6" x 8" (15cm x 20cm) photo. ★Style: Kupari. Collection: Newcastle upon Tyne (NE7 7AD). ★Holds : 30 x 40cm / 12 x 16". ★Material: Aluminium. 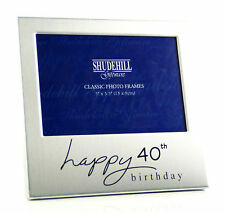 Lovely Chic Modern Charcoal Grey Photo Frame 8" x 10" Stylish design frame with charcoal grey outer edge and silver effect inset Holds a 8" x 10" photo in either portrait ot landscape orientation Metal with glass front Measures H:30 W:25 D:2 cm approx Lovely gift or to frame a special photo. 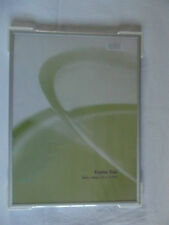 Inside is where your chosen 4" x 6" portrait photo's can be displayed. Add To Favorites. They make perfect gifts. Line 1 (A) will appear in fixed upper case. Lines 2 and 3 (B) are case sensitive and will appear as entered. 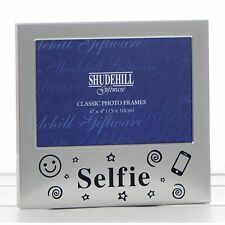 Lovely Chic Modern Charcoal Grey Photo Frame 4" x 6" Stylish design frame with charcoal grey outer edge and silver effect inset Holds a 4" x 6" photo in either portrait ot landscape orientation Metal with glass front Measures H:19 W:14 D:2 cm approx Lovely gift or to frame a special photo. 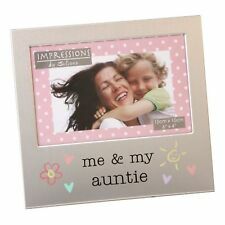 Happy Thanksgiving Photo Picture Frame Gift - 6" x 4"